In a necropolis in Spain, archaeologists have found the remains of a Roman woman who died in her 30s with a calcified tumor in her pelvis, a bone and four deformed teeth embedded within it. Two of the teeth are still attached to the wall of the tumor researchers say. The woman, who died some 1,600 years ago, had a condition known today as an ovarian teratoma which, as its name indicates, occurs in the ovaries. The word Teratoma comes from the Greek words "teras" and "onkoma" which translate to "monster" and "swelling," respectively. The tumor is about 1.7 inches (44 millimeters) in diameter at its largest point. "Ovarian teratomas are bizarre, but benign tumors," writes lead researcher Núria Armentano, of the ANTROPÒLEGS.LAB company and the Universitat Autònoma de Barcelona, in an email to LiveScience. The tumors come from germ cells, which form human eggs and can create hair, teeth and bone, among other structures. 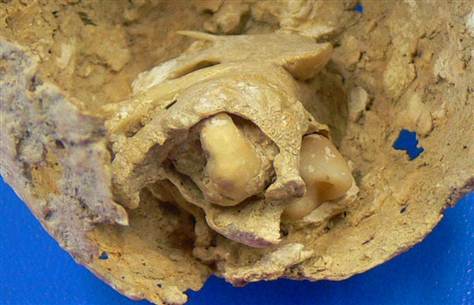 This is the first time scientists have found this type of teratoma in the ancient world. "(T)his is an extraordinary case, not only for its antiquity, but also its identification in the archeological record," writes the research team in a paper published recently in the International Journal of Paleopathology. The woman lived at a time of decline for the Roman Empire, with new groups (popularly known as the "barbarians") moving into Roman territory, eventually taking over Spain and other areas. Archaeologists found the woman buried in a necropolis near Lleida in the Catalonia region of Spain. They only found a few artifacts buried with her: tiles known as tegulae that had been put over her body to form a gabled roof. "Tegulae graves were the most common Roman burials. She was not an important or rich person. She had a low socioeconomic status," Armentano explained. The researchers note in their paper that while it's possible the woman never experienced symptoms, it's also possible that, despite the tumor being benign, it ultimately killed her. "This ovarian teratoma could have been the cause of this woman's death, because sometimes the development of teratomas results in displacement and functional disturbances of adjacent organs," the researchers write. They note that infection, hemolytic anemia and pregnancy complications can also occur with an ovarian teratoma, events that could also have caused the woman's death. The tumor would not have changed her outward appearance, and researchers can't tell for certain what affect it had on her, Armentano explained. "We suppose that, at least during a long part of her life, she was completely unaware of this tumor. Depending on the eventual complications, she could have suffered, but there" is no evidence of this, writes Armentano. "She could have died because of many other causes!" Despite that uncertainty, historical records do indicate that this woman lived in a time period of great change. King's College London Professor Peter Heather notes in his book "The Fall of the Roman Empire" (Oxford University Press, 2006) that, by A.D. 411, Spain had been divided between groups known as the Vandals, Suevi and Alans. The ancient writer Hydatius wrote that the "Spaniards in the cities and forts who had survived the disasters surrendered themselves to servitude under the barbarians, who held sway throughout the provinces."